The Saturn S23R Refrigerator and the Saturn S49R Reach-In Refrigerator are each on sale at MPM Food Equipment Group. Saturn reach-in refrigerators are essential pieces of equipment for anyone in the food-service, hospitality or supermarket industries. 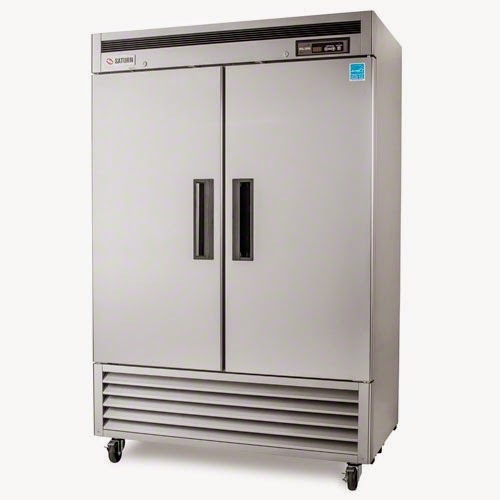 These are critical units for keeping foods at a safe temperature yet allowing them to be easily accessible in storage, prep and service areas. These units are powerful and are able to maintain their temperatures despite heavy use. They provide abundant storage space for their footprints, are easy to clean, and are extremely well constructed and built to last. Saturn equipment is highly regarded in the restaurant industry as providing enormous long-term value. These reach-in refrigerators are specifically constructed to hold up to the challenges of the most demanding commercial establishments. MPM is offering the Saturn S23R Refrigerator and the Saturn S49R Reach-In Refrigerator at amazing prices. These units are in the MPM warehouse and can be shipped immediately. For cooling needs close to the line and where space is at a premium, the Saturn S23R is on sale for $2,004.00, a savings of $3,564.00 from the list price of $5,568.00. For larger storage capacity needs, the Saturn 49R offers 49 cubic feet of space and is on sale for $2,943.00, a savings of $5,233.00 from the $8,176 list price. These outstanding savings go right into the bottom line of your business. Built with durable stainless steel doors, sides and interiors, these Saturn reach-ins provide the peace of mind that you have purchased appliances that will keep your perishables at safe temperatures for the best prices you can find. These units are especially user-friendly, featuring thermometer displays and controls are digital. They also have self-closing doors that provide a stay-open component for easier usage by your staff and an open-door reminder for an extra layer of protection. The bottom-mounted condensers can mean that you have more storage options over the units. These Saturn S23R and S49R reach-in refrigerators have external digital temperature control that allow precise control, helping you to have longer shelf life on your food product and resulting in money savings over the long term. Reach-in refrigerators store some of the more expensive perishable food, including meat, produce, eggs, and dairy products. The doors on these Saturns are self-closing, and for convenience, they also have a stay-open feature. The refrigerators have a door-open alarm for times like rush hour when harried employees forget to shut the door. These models’ quick recovery feature helps to prevent foods from drying out. The appliances use an environmentally friendly R-134a refrigerant, and they are Energy Star rated. This means that they provide high efficiency compressors and fan motors. They operate on less horsepower, and it has been estimated that reach-in refrigerators that are Energy Star rated can save $150 or more annually for operating costs. In addition, these units have bottom compressors, which is the coolest and most grease-free area of the kitchen. This translates into operation that is more efficient in hot kitchens. These Saturn reach-ins are high-end units that feature stainless steel construction both inside and out, making them easy to clean. Because replacing a reach-in refrigerator can be expensive, you are going to want to go with a quality unit. 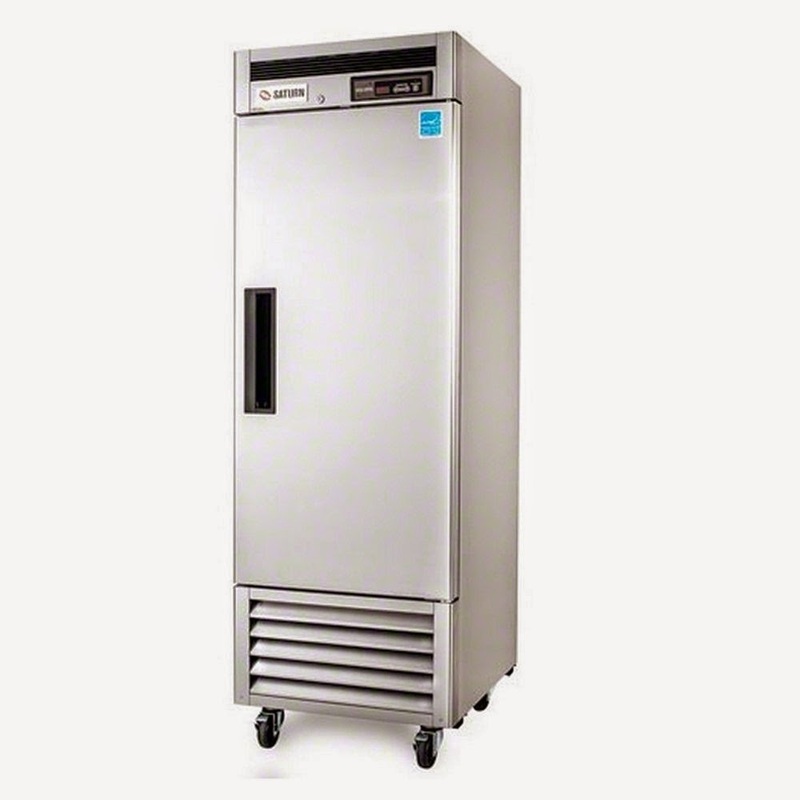 These units operate 24/7, and they receive heavy usage in foodservice operations. But, properly maintained, reach-ins can last 15 years or more; some stay in service as long as 30 years. Call MPM Food Equipment Group at 800.976.6762 to discover more about how these Saturn reach-ins can help the flow of your professional food service organization and how they can enhance your bottom line. You can also email us, and for more information, go to the MPM website.